There are a lot of people asking where to get watch tools and parts in Reddit – likewise on other forums. Here is my list of the most legit watchmaking tools and watch parts resellers that I’ve compiled over the course of my journey. If there is some specific type of part or tool you’re looking for, just CTRL+F it. A German shop selling parts and tools. Nice selection of parts and tools straight from Germany. A nice bonus – this is a place to buy watch ebauches and an outstanding selection of original Seiko movements. A German shop with unique tools and watch parts. In addition to basic watch parts: such as hands, movements, spring bars, and bands – they carry clock parts and some very specific tools such as UV curing lamps, crystal glass cement, knotter tools, extension chains and many other things. Check them out! UK-based merchant sporting a wide selection and competitive prices. What sets Cousins apart from all the other stores is that they have a wide selection of watch brand original spare parts for movements, as well as generics. Besides that, they carry tools and many watchmaking tool spare parts. A drawback is that they want you to confirm that you’re a professional before signing up. Check them out. An American-based shop for a typical watch service and repair centre that does quick watch fixes. Esslinger is a supplier of watchmaking and jewellery tools and supplies. 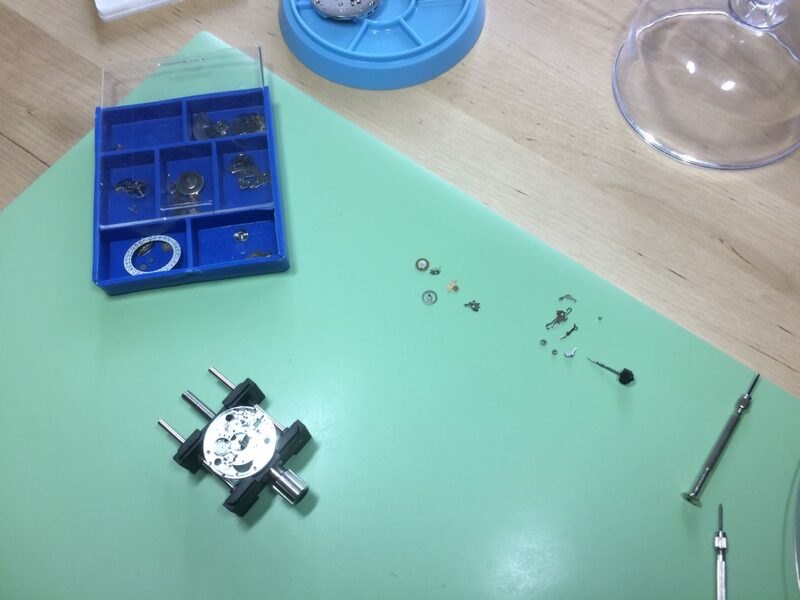 Their speciality is the small nitty gritty items such as band pins and spring bars, batteries, watch crowns, generic Rolex parts all the way to original as well as generic watch movements. They also sell quite a few different kinds of assortment boxes ranging from hands to batteries. The goods are priced average and the quality ranges from low (and cheap) to medium-high. UK-based high-quality watchmaking tools supplier, including polishing and carving tools. Eternal Tools provides solid tools and just that. No watch parts, though. However, you’ll be able to find drill bits, polishing supplies and carving tools. Quality of the tools is medium-high to high and the shipping costs are reasonable. This is my go-to place to buy watch tools. German-based shop for watch and clock parts. Nice resource that stands out with spare parts for clocks, not only watches. Chinese homage watch and parts supplier. They sell white label watches, dials, cases, straps, movements, bezels, date wheels, hands and some other various items. But the best thing about them? They offer custom dial printing. Don’t ask me about the quality, though. Another UK-based medium/high-quality watch repair tools supplier with electrical watch tools. They are resellers of A*F, ETA, Bergeon, Horotec tools and Seiko watch parts. HS Walsh also sells a lot of electrical tools, such as pulse welder units and plating units, watch testers and timing machines. KALYANEDIFFUSION89.COM – French store selling a strange mixture of watch parts and tools. If KD89 was a real physical store, it would probably look like the owner hadn’t organized the stock for the last 7 years and would not even notice you when you walked in because he is preoccupied playing his Nintendo 64. Then you wander around the store and find things like Swiss made Unitas cases, French made Omega hands, ink for dial restoration and real ivory clasps. Anyway, it’s an interesting place to browse if you can be bothered with Google translate and a bit of patience. Reasonable shipping prices. OFREI.COM – The place to source rare high-quality analog tools and original watch parts. Otto Frei online store looks like it was programmed in the 90s and the usability reminds me of cassette tapes, but don’t get thrown back by that. Their gear is actually top-notch. Ofrei inventory ranges from staking sets to lathes. Original Tag Heuer watch dials to special Omega tools. Moebius oils to watchmaking benches. Sapphires to circuit boards. They have eeeverything. Except for abrasive stones. They don’t have abrasive stones. You’d have to look into their jewelry store for that. The international shipping price is quite high, though. PERRINWATCHPARTS.COM – Canadian-based watch supplier with a good selection of movements, bands, batteries, pins & spring bars. More for a watch hobbyist than someone doing repairs. Easy to use website with a lot of essential stuff, but not that much little things. They carry a wide array of movements, for example, Seiko movements, and watch repair kits too. Quality seems medium. German store with a solid selection of cases, dials, hands and a few kits. A very good place to shop for anyone assembling their own watch from a basic ETA or Miyota movement. Here you’ll find a nice selection of good quality gear for a price that varies from €58 to €150 for a case, for example. Looks good to me. There’s some good news and some bad news. Bad news first: They state on their registration page that they only sell to “Watch Repair Trade (no direct sales/hobbyists)”. The good news is that they have a lot of useful stuff. Microscopes. Dryers. Demagnetizers. Ebauché movements. Oils. Reluming kits. Startime supply has got quite a lot of professional gear and watch tools for the satisfaction of any watchmaker. You can shop for tools by brand, which is a nice feature. Quality ranges from “economy” to high. Their selection of watch bands and buckles is way beyond anything I’ve seen before. A good place to shop at, however a minimum order size of $20 applies for within the US and $100 on international orders. WENPING1970.COM – Chinese watch parts supplier selling cheap low-quality items. Wenping1970 sells bezels, cases, copies of movements, hands, et cetera. They even have one movement that tells you what year it is. In case you forget. And to finish it off, we’ll always have Amazon and eBay. That’s it for now. If you know of any more, let me know in the comments section and I’ll update the list for everybody. Thank you for the read and check out our other articles on the Home Page.